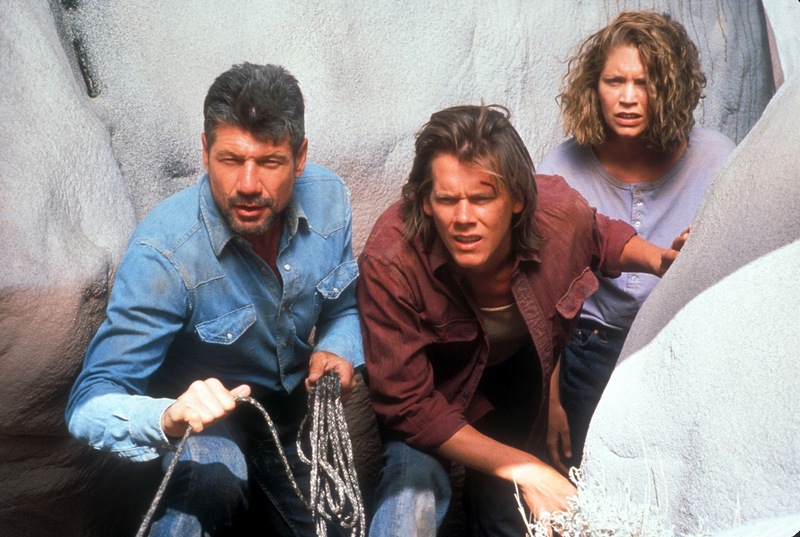 A comic horror flick, Tremors wins on style and attitude. The story of giant subterranean snakes terrorizing a tiny community is as silly as they come, and it gets the treatment that it deserves, heavy on fun, character, and charisma. 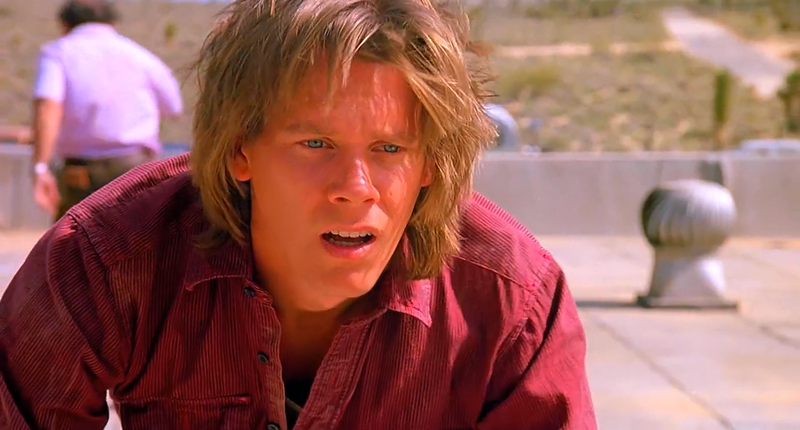 In and around the Nevada desolate desert town of Perfection (population: 14), the resourceful Val (Kevin Bacon) and Earl (Fred Ward) do odd manual jobs and live an uncomplicated life, but hope for better things in bigger towns. They meet Rhonda (Finn Carter), a seismology student on a summer assignment to monitor seismometers in the area. She reports unusual activity, and soon people and cattle are found dead, sometimes gruesomely dismembered. Rhonda, Val and Earl barely survive a close encounter with an ugly, large snake-like beast that travels underground and carries a huge appetite for soft human flesh. They retreat to Perfection, and team up with the local population, which fortunately includes the heavily-armed survivalist couple Burt (Michael Gross) and Heather (country music star Reba McEntire). A siege ensues, with the humans having to survive against repeated attacks from three of the hideous predators. Tremors plays up personality, and gets away with it. There is nothing here to be taken seriously, and even the more horror-oriented scenes of the monsters devouring victims are more invigorating than scary. Ron Underwood, directing his first feature length movie, succeeds in making the locale and characters much more important than the monster elements. The setting evokes the imagery from every Roadrunner cartoon, and the film plays with the same sensibilities. Tremors finds a winning combination in Val and Earl, two men rough around the edges, mostly made up of edges, and expertly brought to life by Bacon and Ward. Limited yet resourceful, always talking about the need for a plan but rarely coming up with one that fully works, Val and Earl possess the perfect set of handy skills to create a fair fight with mammoth but blind underground snakes. 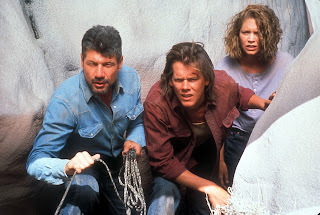 Running an efficient 96 minutes, Tremors keeps things simple, Underwood moving the action along quickly, promptly arriving at the energetic people versus monsters moments, and allowing the slick interplay between Bacon and Ward to provide plenty of sharp relief at regular intervals. The rest of the cast members are there mostly to make up the numbers of local residents and token victims. Finn Carter tries for perky but cannot shake well-entrenched daytime soap and television acting skills, nor does she really need to, while Michael Gross and Reba McEntire make more of an impression as survivalists with a basement that the Pentagon would be proud of. In concept and delivery, Tremors burrows its way to ground shaking entertainment in a compact and boisterous package.